The Mayor, Cllr P Stevens presented the Mayors cup to Sgt.Cadet Rosie Huff of 2012 Sqd. Caldicot ATC at Caldicot Choir Hall. More than 60 people were in attendance. Mayor Cllr P Stevens being presented a certificate from the ATC to the Mayor and Caldicot Town Council for the help they have given to the ATC. The Mayor with his consort Cllr M.Stevens presenting the Mayors cup to Mike Bruce, Caldicot Bowls Club. 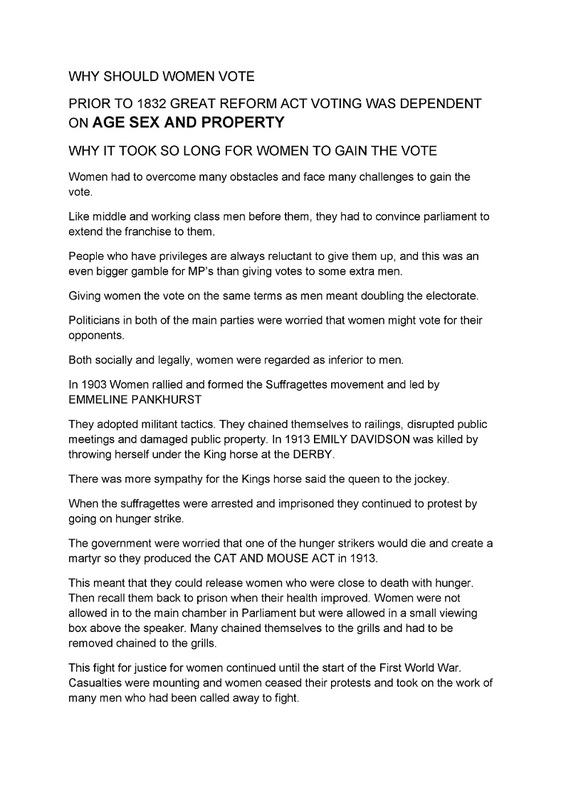 The speech delivered by the Mayor at the presentation. The Mayor Cllr P.Stevens and his consort Cllr M.Stevens attended a meeting of the Caldicot branch of the British Leigion. Peter Wilson the chairman gave a rundown on the plans for their pilgrimage to France in August to commemorate the end of the 1914/1918 World War. Hundreds of British Leigion groups will attend this major event. Caldicot Town Council donated £500 towards the trip. The Mayor and consort with Peter Wilson chairman, Gordon Hill president and the two nominated standard bearers Andrew Roberts who will carry the Caldicot banner and Rob Preston the Chepstow Banner. The Mayor, Cllr P Stevens presented Julian Williams with the Mayors cup at Caldicot AFC for services to the club and community. More than 100 people attended Caldicot Rugby Club to celebrate Mike Hobbs receiving the Mayors Cup from the Mayor, Cllr P Stevens. The Mayor also made a presentation of flowers to his wife Jean for all the help she gave him over many years. Words from the Mayor - "The Town Team should be complimented on the Easter market and the egg hunt. Many people with their children turned out with the aim of collecting a letter written on a rock in each shop. They then had to use the letters to write a phrase on a competition form. This was an excellent opportunity to get people to at least look into our local shops. Over 40 children in three categories entered the Easter egg colouring competition. The Mayor Cllr P.Stevens was invited to judge the competition. The winner of each category won a comprehensive art set. 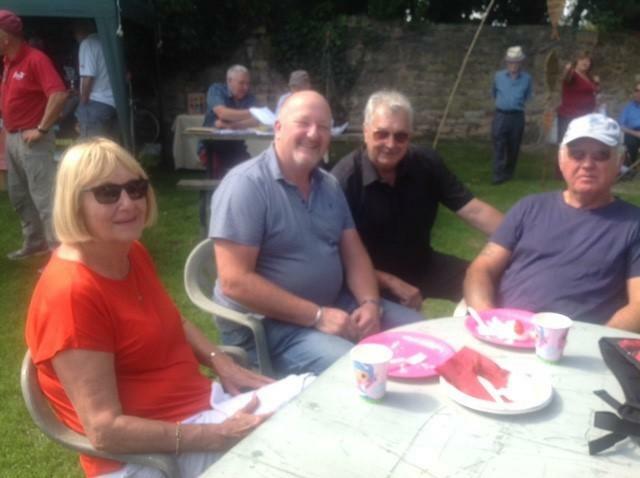 Many of the people spoken to enjoyed the days event and said that it was an excellent way of promoting Caldicot." Rev Cannon Jeremy Harris, Richard "Sandy" Blair CBE Deputy Lord Lieutenant of Gwent, Cllr Philip Stevens Mayor Caldicot Town Council, PC Alison Finister Schools Liaison Officer, and Cllr Donna James Chair Magor with Undy Community Council. The Mayor, Cllr P Stevens was shown the cadets using the flight simulator which the Town Council helped to finance. Flt/lieutenant L. McKie RAFAC officer commanding 2012 Caldicot squadron ATC. said the flight simulator gave the cadets a good grounding in flying an aircraft and he thanked the council for helping the squadron obtaining the equipment. The Mayor, Cllr P Stevens presented the Mayors Cup to James Lopategui, member of Caldicot Castle AFC. The Mayor Cllr P.Stevens was invited to open Caldicot Bowls Club for the start of the season and after the refurbishment of the club house.The Mayor was asked to bowl the first bowl after an opening speech. The members then invited the Mayor and his consort Cllr M.Stevens to stay for tea. The members playing a game to start the season. Speech delivered by the Mayor at the opening of the bowls club. 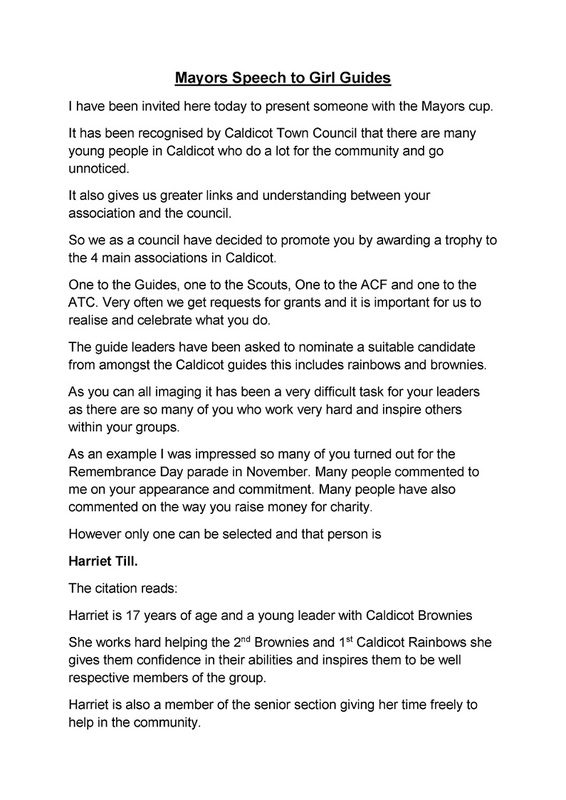 The Mayor Cllr P.Stevens was invited to the 75th Anniversary AGM of the Gwent Trefoil Guides. The event took place at Caldicot Guides H.Q. Mrs R.Waring the Division President was presented with a certificate and pin celebrating 40 years service. Mrs A.Tindall, Chepstow Division Commissioner, Mrs R.Waring, Division President, Andrea Ridley County Commissioner. 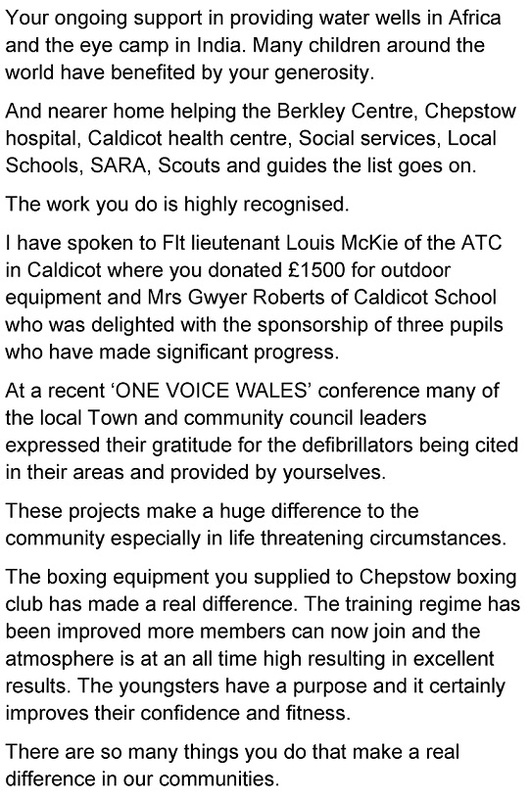 The Mayor, Cllr P Stevens attended Caldicot Boxing Club. Martin, who recently received the Town Councils Citizens Award for starting the boxing club, showed the Mayor the members training. There are now more than 40 members of all ages. The Mayor, Cllr P Stevens presenting the Mayors Cup to Mark Lane, 2nd Caldicot Scouts. L to R: Mayor, Cllr P Stevens, Scout leader Rachel Smith, Mayors Cup winner Mark Lane and the District Treasurer. Mayor, Cllr Philip Stevens, presented a bouquet of flowers to Mr & Mrs Patterson in celebration of their 60th Wedding Anniversary. Message from the Mayor - There are many young people who do a lot of work within the community and what they do goes unnoticed. 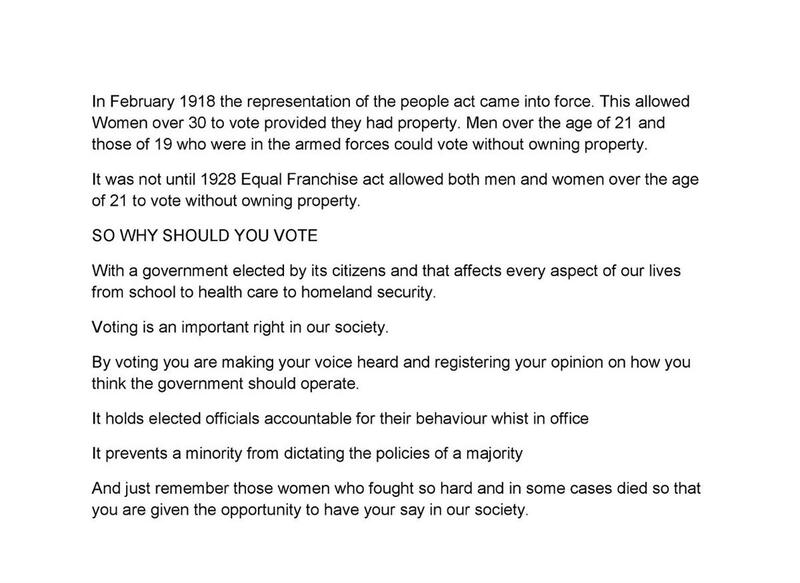 Caldicot Town Council resolved to recognise these people by introducing a Mayors cup for each organisation in Caldicot. The first cup was awarded to L/CPL Joshua Prout of the Army Cadet Force. The ceremony held at the ACF headquarters on Mill Lane, Caldicot. In attendance was the parents and Grandparents of Joshua, Town Mayor Cllr Philip Stevens, his consort Cllr Maria Stevens and the Mayor Cadet Bryn Silcox. S/SGT Jackie Barton, the Detachment Commander, S/SGT John Morgan and the Army cadets. The Gwent young farmers held their Pantomime competition 2018 at the Dolman Theatre Newport. This competition was held over two nights, the 2nd and 3rd February. The Mayor was in attendance for the two nights. The first night he was accompanied by the Mayors Cadet & the second night was accompanied by his consort, Cllr M Stevens. 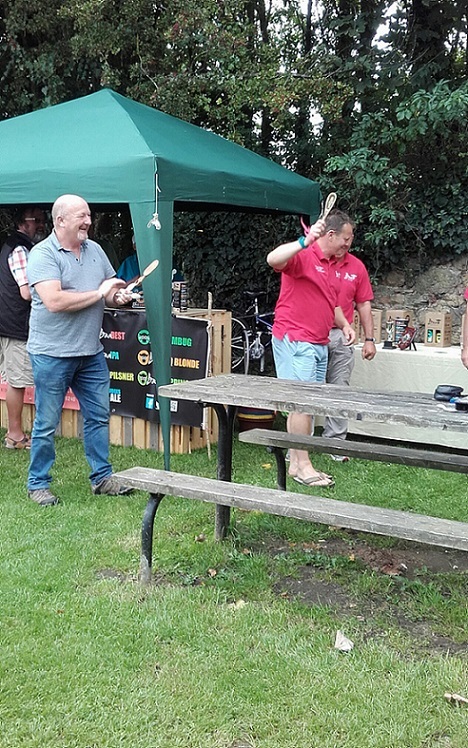 There was fierce competition between the five clubs who took part. Bedwas YFC put on the 'Gruffalo', Wentwood YFC put on 'Treasure Island', Abergavenny/Crucorney YFC put on 'Sinbad', Usk YFC put on 'Alice in Wonderland' and Ragland YFC put on 'We Will Rock Wonderland'. The Mayor of Caldicot & The Mayor of Usk were in attendance and witnessed a sensational series of Pantomimes which were colourful, well-rehearsed and funny. The music, singing, lighting and set designs were outstanding.The cast of all the clubs gave a sterling performance showing the high quality of the youth we have in Monmouthshire. Mayor, Cllr Philip Stevens, presented a bouquet of flowers to Mr & Mrs Peters in celebration of their 60th Wedding Anniversary. The Mayor was invited to Caldicot Rugby Club for the game between Caldicot XV against Cwmbran to raise money for charity. 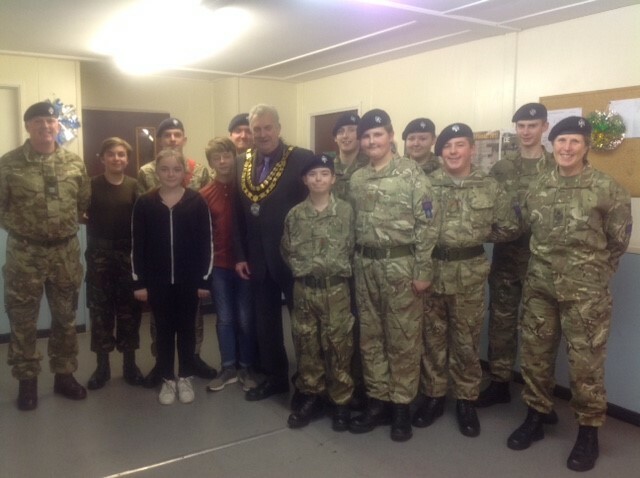 The Mayor, Cllr Philip Stevens visited the Caldicot Army Cadet Force. He praised them for their recent participation at the Remembrance Service. S.Sgt Jackie Barton commanding the unit pointed out the life skills they are learning and the input they have in the community. The Mayor attended Dewstow Schools Christmas Fayre on Thursday 7th December. The school staff and members of the PTA had worked very hard to put on this event. Many parents and residents attended hopefully spending lots of money to boost school funds. The Mayor, Cllr P Stevens with school pupils. The District Governor Mr Steve Petty, Mayor of Caldicot Cllr P Stevens, Mayor of Chepstow Cllr D Rook And the Lions President Mr J Robinson. The Mayor of Caldicot, Mayor's Consort and two past presidents of the Lions. Girl Guide dressed in a 1918 Girl Guiding uniform. Mayor, Cllr P Stevens, Cllr M Stevens, Cllr M Mitchell, Cllr A Easson, Mayor's Cadet Bryn Silcox and Jessica Morden, MP. At the Chepstow and Caldicot Lions annual dinner the Mayor of Caldicot praised the work and contributions made to the communities by the Chepstow & Caldicot Lions. 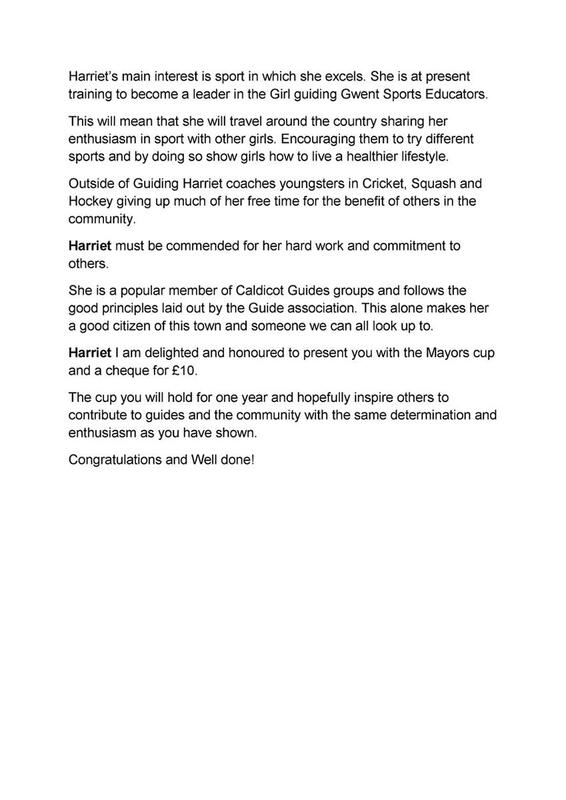 Mayor, Cllr P Stevens presenting the Caldicot Town Council Mayors Cup to Harriet Till. Amongst the congregation was the Mayor and Deputy Mayor, Jessica Mordon, MP, John Griffiths, AM, together with many Town councillors. 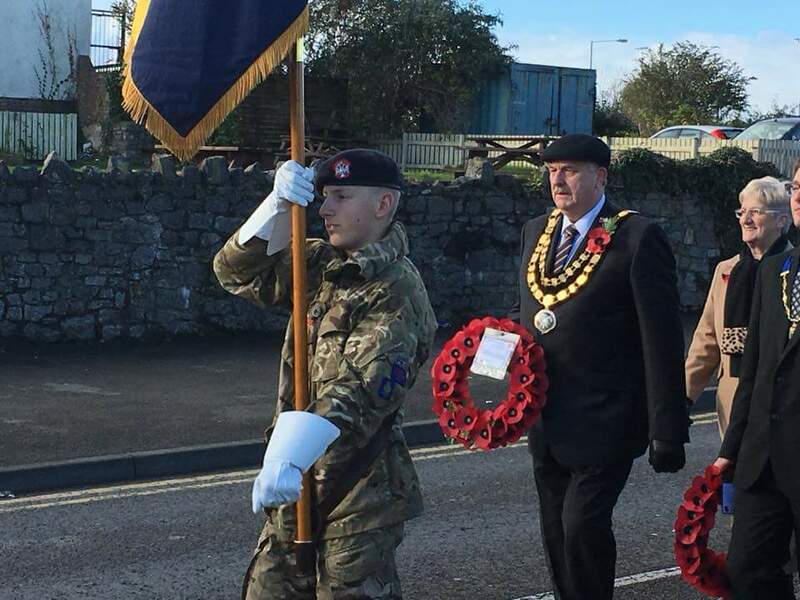 The parade led by the Severn Tunnel Band, moves off to St Mary's Church, Caldicot for the Remembrance Day Service. The Mayor carrying the wreath. 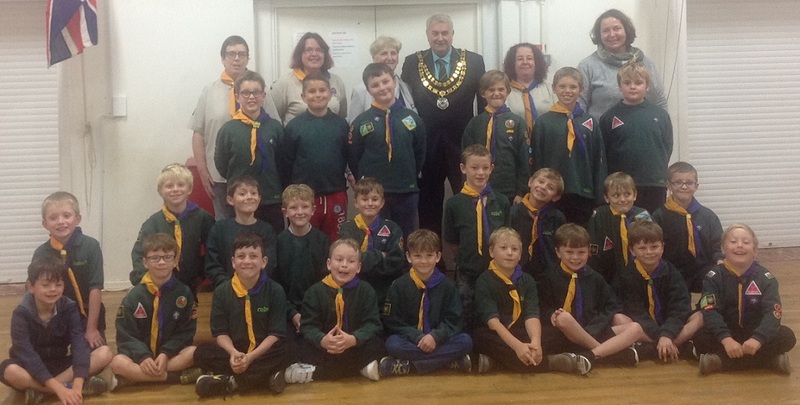 The Mayor, Cllr Philip Stevens and his consort, Cllr Maria Stevens met with the 2nd Caldicot cubs. The cubs were in the process of earning their catering badges. The Mayor and consort were asked to sit at a table and joined in by tasting some of the food prepared by the Cubs. The Mayor, Cllr Philip Stevens met the Caldicot Brownies at their premises on KGV Playing Fields. He joined their circle and took part in singing and rituals practised by the Brownies. The Mayor showed them the Chain of Office and pointed out the Caldicot crest and the names of Mayors of Caldicot on the links. Each of the Brownies including Brown owl tried the chain on and commented on the weight of the chain. The Mayor, Cllr Philip Stevens would like to thank the Town team for organising and Marshalling this prestigious event. The Mayor along with many Caldicot residents greeted the riders as they went by the Council office. The number of motor bikes were estimated at between 6000 to 7000 the greatest number to date for this event raising hundreds of pounds for local charities. 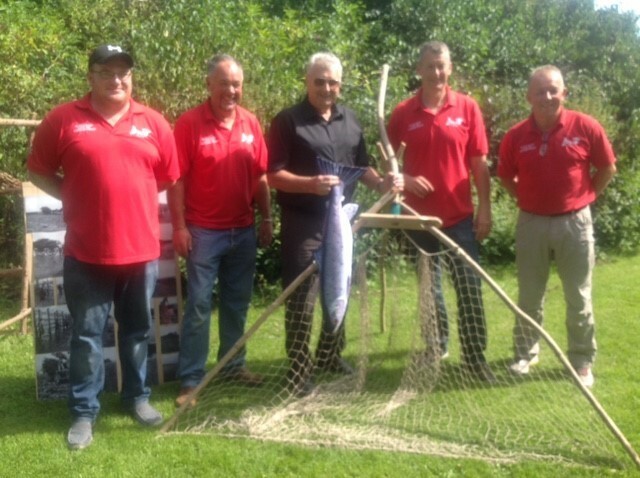 The Town team had set up the Caldicot Castle field with lots of attractions for the riders to enjoy. We all look forward to this event taking place next year. The Royal Navy Association Trafalgar mess dinner. Held at the Mission to Seamen, Newport. Chairman S/M. J. Attenborough. LM. 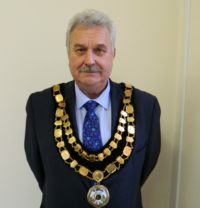 Mayor Cllr P Stevens. Consort M. Stevens. President S/M G. Blackborrow. The Mayor was invited as the principle speaker at this annual event. More than 40 retired Navy veterans were in attendance. The event took place at the Park Hotel Cardiff on Sunday 16th July hosted by Ahmadiyya Muslim Community. 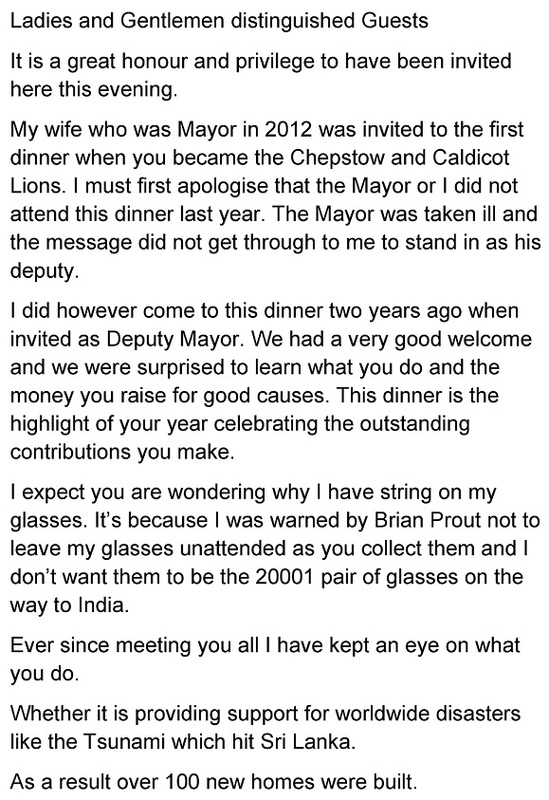 Every year for the past 5 years the Mayor of Caldicot together with other dignitaries are asked to attend the EID dinner. EID marks the end of the holy month of Ramadan. 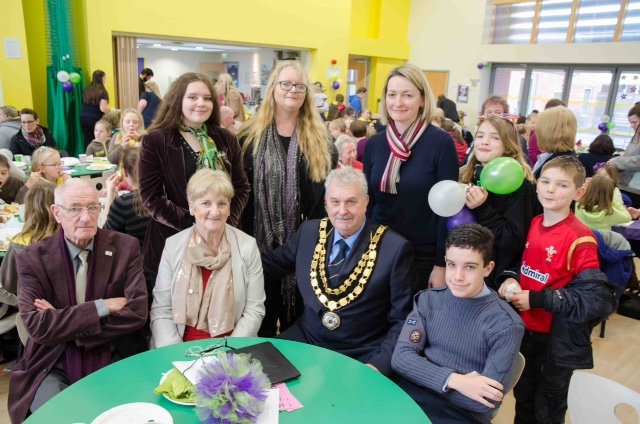 Speeches were made by a number of distinguished guests, including the Mayor of Caldicot. The Mayor of Caldicot and Consort with the Lord & Lady Mayor of Newport after receiving £500 each for their chosen charity. presented a wooden spoon to Chris Hourihane. 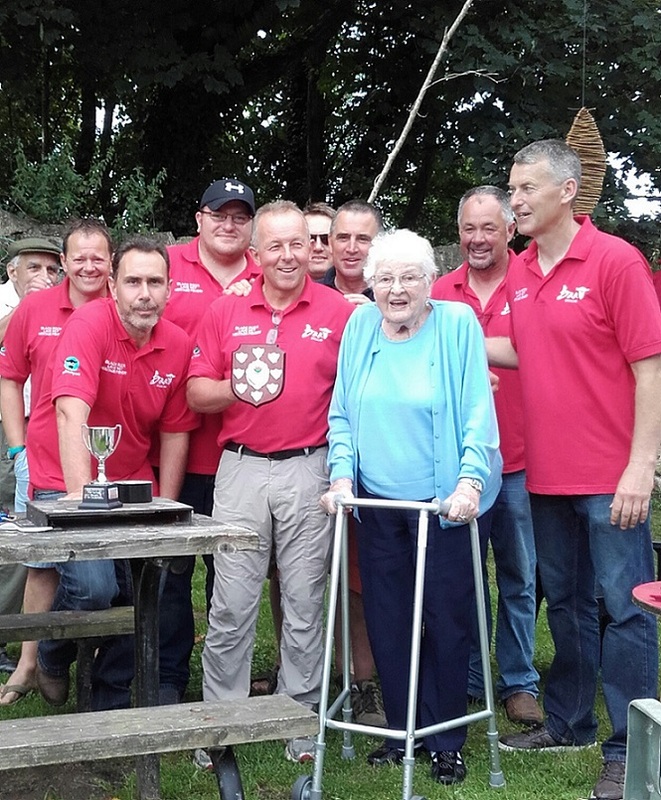 Paul Watkins being presented the shield for best catch of the season. Mayor, Cllr P Stevens set off last Saturday's (5th August) Caldicot Parkrun. Reaffirmation of the Freedom of Monmouthshire Parade 2017, held in Abergavenny on Sunday 16th July 2017. To read the Mayors Address delivered during the Civic Ceremony, please click here. The Mayor would like to thank all that attended the service and the reception afterwards for a marvellous day. Cllr Philip Stevens, Mayor of Caldicot, attended the Monmouthshire County Council Civic Sunday on 25th June 2017. Chair of Monmouthshire County Council addressing guests at her Civic Ceremony, Sunday 25th June 2017. 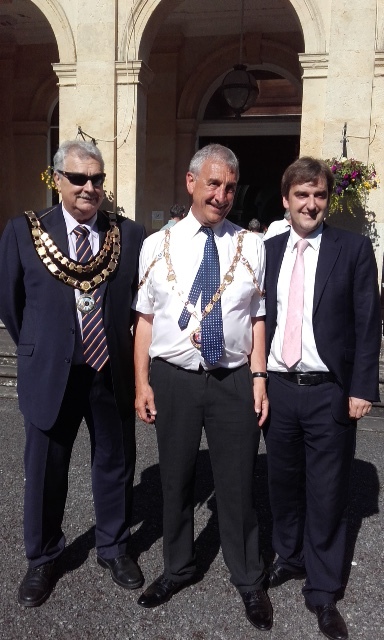 Mayor of Caldicot, Cllr Philip Stevens with the Lord Lieutenant of Gwent and the past Chairman of Monmouthshire County Council, Cllr Jim Higginson. Cllr Philip Stevens, Mayor with Cllr Felicity Cotton, Mayor of Monmouth and Cllr Maureen Powell, Chair of Monmouthshire County Council. Mayor of Caldicot, Cllr Philip Stevens chatting to the Vice Chairman of Gloucester County Council, Cllr Graham Morgan. The Mayor, Cllr Philip Stevens, attended the Gwent Young Farmers Clubs Rally 2017 on Saturday 17th June. He said "Lots of competitions went on throughout the day from cookery, singing, dancing, designing sports wear, hats for Ascot, sheep shearing, and a lot more". It is a great honour to be elected Mayor of Caldicot Town Council 2017/18 and would like to thank my fellow councillors for their support in electing me to this prestigious position. 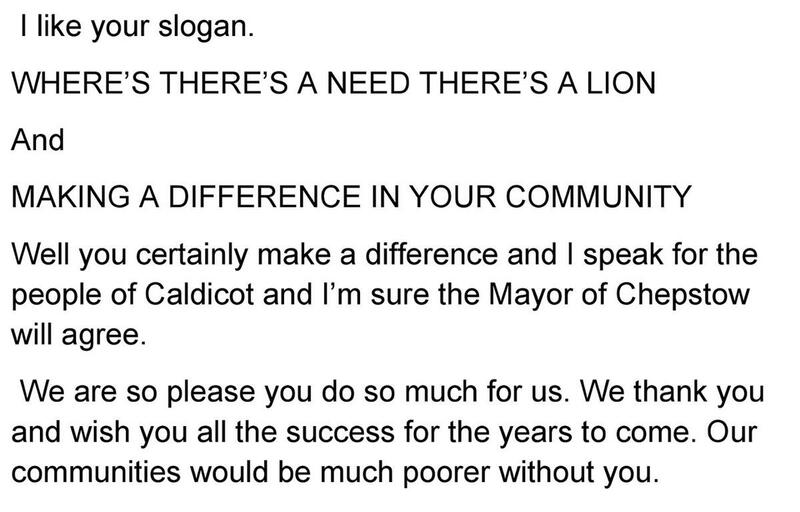 I promise to be a good ambassador promoting Caldicot to the best of my ability. Caldicot is the youngest of the five Monmouthshire towns but we are the second largest in population and growing. I was born in Caldicot 65 years ago when Caldicot was a small village with a population of less than 1500 people. Caldicot was a wonderful place to grow up every one knew everyone and we had lots of fields and orchards to play in. Some of you might remember Dally’s sweet shop and Ray’s Triangle cinema known as the ‘sit and scratch’. I and my siblings attended the local church and we were all in the church choir. I attended the ‘village college’ as it was known and then finished my education in Newport at a pre-apprenticeship school on Corporation Road. I had a varied career serving first a four year apprenticeship as a toolmaker. A few years improving my skills then I joined the Merchant Navy. I quickly rose to the rank of First Engineer with a company called ‘Canadian Pacific’. In 1983 after the Falklands conflict I left the Navy and retrained as a teacher. I became ‘Head of the Technology faculty’ at Chepstow School retiring in 2011. I loved working with children and it gives me a great feeling when I meet ex- students and they tell me how they have got on in life. I am a married man with a large family a son, three daughters and eight grandchildren. All live in or around Caldicot and appreciate how lucky they are to grow up in such a special place. I am now semi retired working during May and June for an examination board. I visit schools all over the country to moderate students design Projects to ensure standards are maintained. I believe it is important that we all give something back to our community and I do this by being a volunteer driver for ‘Grass Routes’. Many people know me and I am often asked when driving the bus to stop and run into the surgery to post their repeat prescriptions. I have also given help to the friends of Caldicot Castle working waist deep cleaning out the pond within the Castle grounds. It is important we protect the great Town in which we live and I would like to pay tribute to the many volunteers who give their time freely for the benefit of others who are less fortunate than themselves. I look forward to an interesting and rewarding year promoting Caldicot and with the help from my fellow councillors improving facilities within the Town. My chosen charity for the year is Barnardos and I ask your support in raising funds for this well established charity. Mayor, Cllr Philip Stevens, presented a bouquet of flowers to Mr & Mrs Moss in celebration of their 60th Wedding Anniversary. Councillor Philip Stevens is the Mayor of Caldicot for the 2017/2018 Civic Year.